Please note that is a past initiative, for the most recent data please click here. The California Family Needs Calculator (formerly the Family Economic Self-Sufficiency Standard or Self-Sufficiency Standard), quantifies the costs of basic needs for California’s working families. Many policymakers, advocates, services providers, foundations, and families use the Self-Sufficiency Standard to make informed decisions on working family issues. It measures the minimum income necessary to cover all of a non-elderly (under 65 years old) and non-disabled individual or family’s basic expenses - housing, food, child care, health care, transportation, and taxes - without public or private assistance. 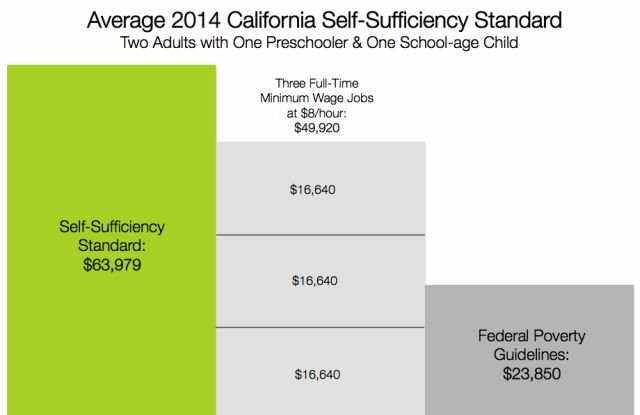 The California Self-Sufficiency Standard is available for all 58 counties across the state. This tool allows you to look up the Self-Sufficiency Standard for a specific county and household type in California. How much is enough to make ends meet in your county? To see the Self-Sufficiency Standard for your county and which families are struggling to make ends meet, use the most up-to-date Self-Sufficiency Standard Look Up Tool here. To view the methodology for the Self-Sufficiency Standard for California, click here. To learn how the Family Self Sufficiency Standard tool is used, click here. Interested in economic security for those 65 years and older? Click here to learn more about the Elder Index, the county-specific measure of the minimum income needed for individuals 65 years and older.